↑ "Today in History". The Guardian. Associated Press (London). June 13, 2009. Archived from the original on December 26, 2013. http://www.guardian.co.uk/world/feedarticle/8556516. अन्तिम पहुँच तिथि: January 23, 2008. "Actor Chris Evans is 28." ↑ Itzkoff, Dave (July 8, 2011). "Chris Evans in 'Captain America: The First Avenger'". The New York Times. 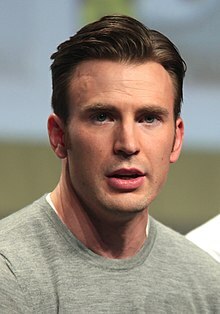 http://www.nytimes.com/2011/07/10/movies/chris-evans-in-captain-america-the-first-avenger.html.